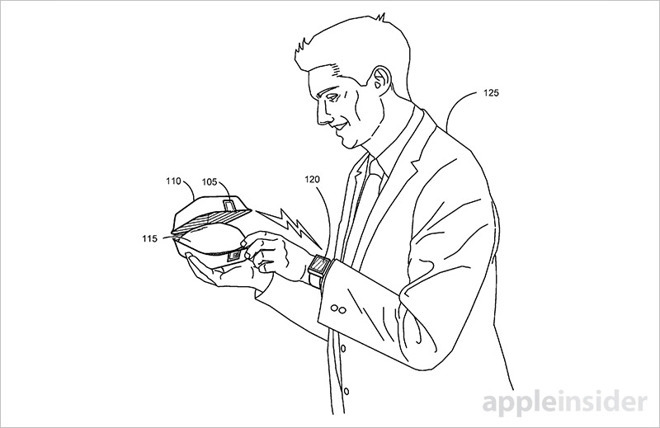 As Apple wades further into health industry waters with products like Apple Watch, the company on Tuesday was granted a patent for technology that would allow food vendors to embed nutritional information in device-readable RFID tags. The solution presents a unique and partially automated solution to calorie counting, one of the more laborious aspects of maintaining a healthy lifestyle. Granted by the U.S. Patent and Trademark Office, Apple's U.S. Patent No. 9,640,088 for "Electronic tag transmissions of custom-order nutritional information" describes a method of encoding RFID tags with details regarding one or more food items. The tags then transmit nutritional variables, such as caloric value, fat content, sugar content and more, to a waiting NFC-capable device like iPhone or Apple Watch. Importantly, the invention allows retailers, or electronic vending machines, to assign nutritional information on a per-item basis, meaning users can mix and match foods as part of a larger order. For example, a user might order a hamburger with extra cheese and no mayonnaise, a small order of fries and large soda. 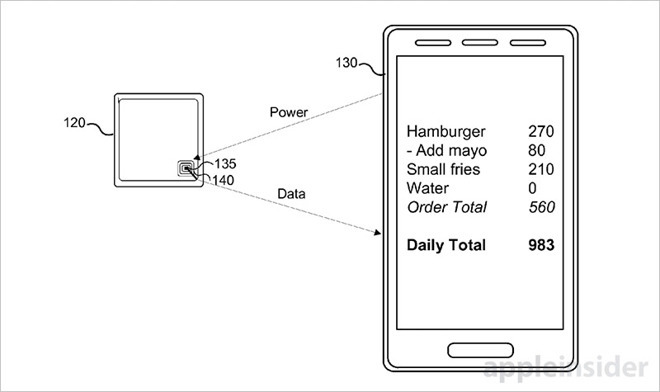 In some embodiments, the electronic vendor device is capable of combining nutritional variables for said hamburger — bread, meat, cheese, lettuce, ketchup, mayonnaise and other condiments — to generate an RFID tag. The process can be further refined by assigning nutritional variables to particular ingredients. 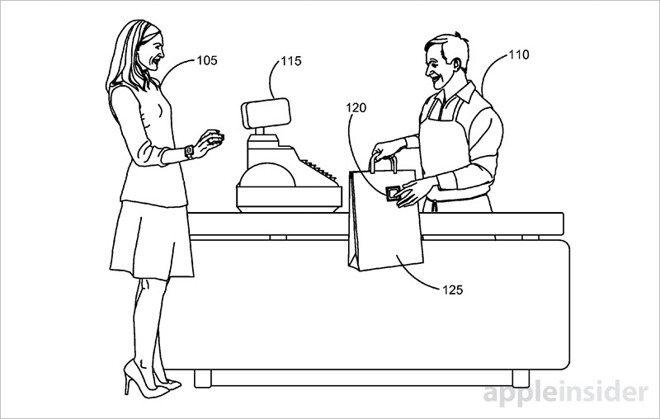 Once the tag is generated, an employee places it on a food order package or receipt, which is then read by an Apple Watch or iPhone. Illustration from Apple's related U.S. Patent No. 9,396,369, of which the '088 patent is an extension. With the nutritional data stored on a user device, specific metrics can be applied to a health monitoring app responsible for maintaining user-assigned variables like a daily calorie budget. In some examples, the assigned nutritional value is deducted from a daily allowance, better informing users of what they should eat at their next meal. Going further, Apple's invention also specifies techniques of estimating whether a user consumed part or all of a particular food item. An app might poll onboard motion sensors to determine whether a user moved their arm to their mouth, for example. Alternatively, data from biometric sensors measuring a user's heart rate might indicate that they were eating. The technology presents an ideal alternative to current app-based solutions that rely on static databases of commonly consumed foods. Some systems also estimate the nutritional value of generic meals, while others require users to input metrics manually. Whether Apple intends to include the invention as part of a future value-added service remains unclear, though the company would have to overcome substantial hurdles to implementation. Like any new service technology, wide adoption would be a major concern for a fledgling nutritional tracking product. Restaurants, grocers and other purveyors would have to invest not only in Apple's RFID technology, but also in the maintenance of a food nutrition database, employee training and other considerations. As it stands, the invention smacks of technology Apple might roll out for employees at its campus, perhaps at an Apple Park cafeteria or restaurant. Apple's interest in health technology has steadily increased over the past few years. Starting with the introduction of HealthKit, then biometric hardware on Apple Watch, Apple has pushed deep into the sector and now positions Apple Watch Series 2 as a dedicated fitness wearable. Aside from shipping products, Apple has long been rumored to market a full-fledged health-tracking device, and those whispers gathered steam last year. Moving far beyond Apple Watch's heart rate monitoring functionality, Apple is purportedly developing hardware capable of tracking changes in user blood sugar levels. Specifically, a report last month claimed the company has for the past five years been working on noninvasive glucose monitoring sensors, widely considered a "holy grail" of modern medical technology. Apple's RFID-based food nutrition tracking system patent was first filed for in April 2015 and credits Todd Whitehurst, Zachury Minjack, Zachery Kennedy, Dennis Park, Dylan Edwards and Anton Davydov as its inventors.